Suzette Doepke is a longtime National Advisory Council leader for the College of Education, and with her husband Greg is also a faithful financial supporter of the College, where they are members of the Dean’s Circle and the College’s 1915 Society. Like many Auburn fans, the Doepkes attended the January 2 Auburn-Oklahoma Sugar Bowl game. The trip had a special meaning for the couple, who also attended Auburn’s Sugar Bowl game against Oklahoma the last time the two teams tangled – on New Year’s Day, 1972. The Army Ranger training had three parts, including one at Ft. Benning. There was also a mountain phase, as well as the infamous “Florida swamp” training. Although they did not see much of each other in this period, Greg and Suzette continued to exchange letters. After watching Auburn suffer a bruising loss to the famous Sooner Wishbone ground attack, Greg completed Ranger school and was sent by the Army to Colorado, but the two continued to stay in touch. When Suzette visited the young officer in Colorado, the two became engaged. 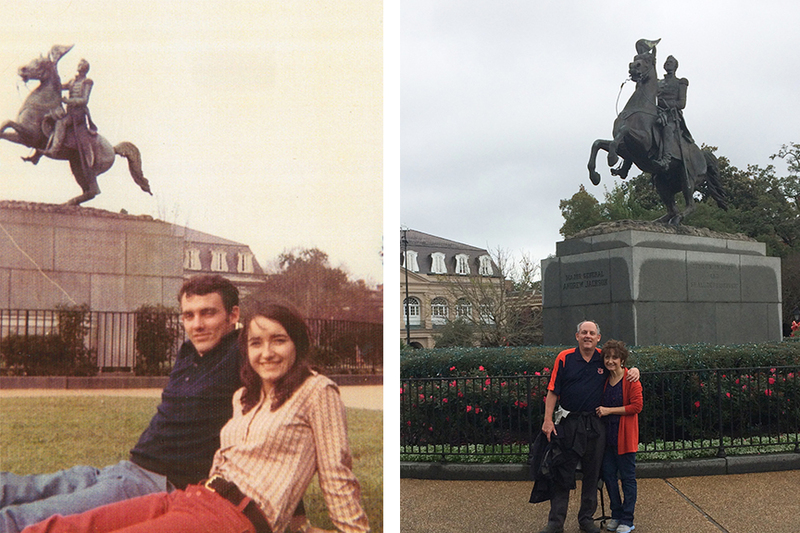 Forty-five years and one day later, Greg and Suzette returned to the Sugar Bowl, endured another Auburn defeat at the hands of Oklahoma, but made time once again to visit Jackson Square, that magical place where a complete stranger had snapped their first-ever photo together.